My team Monaco got SILVER! The 25th European Club Chess Cup just finished a few minutes ago. 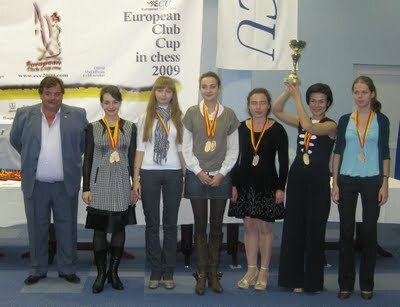 The team of Spartak Vidnoe took the women's european club chess cup. Tatiana Kosintseva, Antoaneta Stefanova, Nadezhda Kosintseva, Kateryna Lahno and Evgenija Ovod played for this team. Above you can see the photo of the happy winner team from the closing ceremony. My team of Cercle d'Echecs Monte Carlo took silver medals. I took 4 out of 6 with a very nice win in the Dragon variation in the last round against Inna Gaponenko which I will certainly comment for you as well as will write a full report with many photos and commented games. But I will do it in the next 2-3 days since already in 2 hours I will need to leave the hotel and go to Skopje where I will take the train to Thessaloniki from where I will go to Halkidiki to take part in the 80th FIDE Congress as I am both a member of the FIDE Presidential Board and the Co-Chairman of the Commission for Women's Chess. Since I haven't updated my blog for a while because I was playing and when I play I focus only on the tournament and the games many interesting women's chess events and tournaments have taken place. The 2nd FIDE Women's Grand-Prix tournament that was held from September 27 to October 10 in Najing, China was won by the former women's world champion Xu Yuhua from China, who scored 8 points out of 11. Second place was taken by Nana Dzagnidze from Georgia, and the third place went to Zhao Xue from China. The full results and standings can be seen here. In the women's US Chess Championship the defending champion Anna Zatonskih is leading the event with 4,5 out of 5, a full point ahead of the field. The championship has a very nice video and photo coverage that can be seen on the official site of the championship. Many people have asked me to see my last game against Gaponenko, here it is in PGN format. You can simply copy the moves and paste them into www.pgnplayer.com to see the game in a player. I will comment the game in detail very soon. Nice game, Alexandra! And congratulations on the silver medal! La preparación para 26.Bxf7+! fue magnífica!!! Mui bella partida!